We’d all love to have a huge, gourmet kitchen that’s fit for a professional chef — even if we aren’t actually big cooks ourselves. A huge, open kitchen just looks more sophisticated and glamorous. 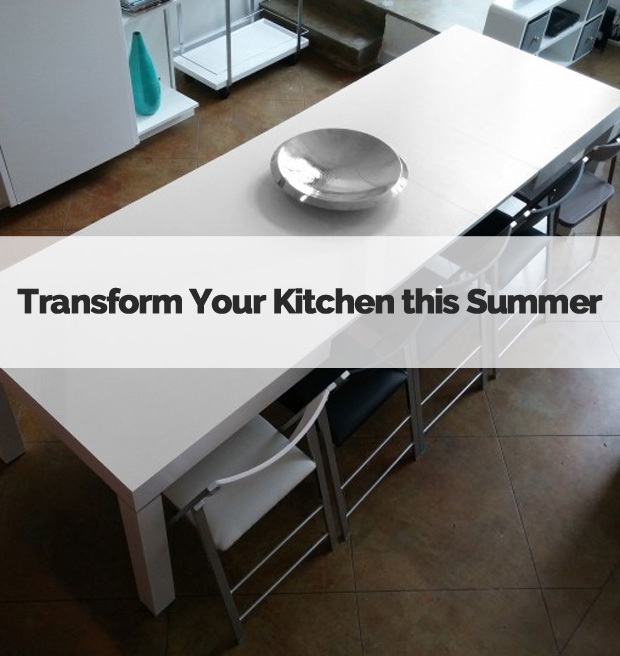 The good news is that you don’t necessarily need to do a huge remodel if your kitchen is not already large and open. Sometimes, all you need is the right furniture to make the space appear more open and inviting. An expandable dining room table can provide a space for you to enjoy your daily meals, as well as enough room to accommodate guests when you have them. That way, you don’t have to clutter your dining area with a huge table that is only at partial capacity the majority of the time. Traditionally, most expanding dining room tables have been wood. While these tables may be beautiful in a more traditionally decorated home, they can appear out of place in the modern home. An expandable glass dining room table can give you the functionality and the look you need. The Butterfly Expandable Round Glass Dining Table is a beautiful option that would look just as good in a breakfast nook as it would in a formal dining space. The table is perfect for two diners in its base state, and it can seat up to eight when expanded. 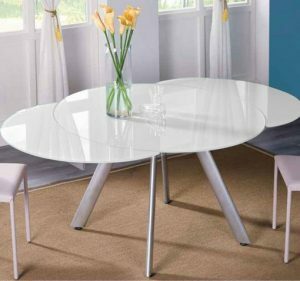 The Opulent White Glass Extendable Dining Table has a more upscale look that is more appropriate for more formal decor. 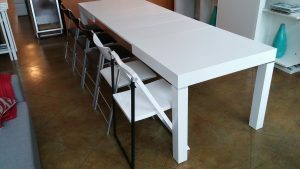 The rectangular table top sits on a white pillar with metallic accents. 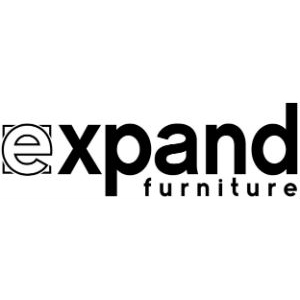 When expanded, the table can seat eight to 10 people. In its base state, the table can seat two to four people. Both tables have a sophisticated design that is perfect for your modern decor, and both can help you save space by remaining in a smaller configuration until actually needed for guests. You may want to throw a dinner party occasionally that will require making room for more guests. Or you may decide to host the family gathering at your home for the holidays, which will bring a lot more people to your dinner table. You don’t have to maintain a formal dining room with a huge table that only gets used for these occasional get togethers. Instead, you can invest in an extending 12-seat dining table that you use for everyday dinners and only expand when needed. That way, you can use that dining room to display your beautiful China or you can use it as an office space for the rest of the time. The Pillar Dining Table that Extends to Seat 12 is a great option. It has a simple, streamlined design that is perfect for modern homes. Its easy design allows you to just pull the legs apart and add the eaves to the middle, creating a surface that can serve 12 dinner guests. If you have more diners, you can invest in the Mega Abode Extending 14-Seat Table. Like the Pillar Dining Table, the Mega Abode has a simple design. However, it is in grey wood paneling with steel legs, which has a more cutting-edge look. The table can seat 14 diners. Both tables are easy to use and beautiful. Make serving your guests easy with a kitchen island cart. Instead of investing in various serving buffets and bars, you can put what you need on the cart. 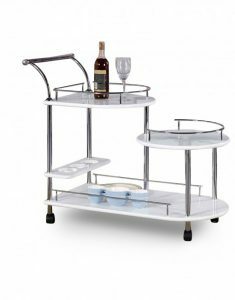 Bring your guests drinks, snacks, ice and more with this attractive serving cart. You can also leave the cart in your kitchen as an impromptu serving station. It will give you more room for storage without taking up a lot of space in your kitchen. 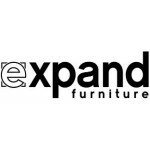 Expand Furniture has multiple space-saving options for your kitchen and other rooms in your home. 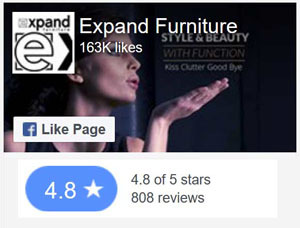 You can find attractive furniture that will improve the look of your home while also helping you to make the most of your space. 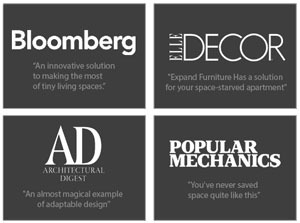 Browse our catalog to find the high-quality furniture you need to bring your space to life.